Our involvement with the school has grown over the last eight years and three members take their role as governors very seriously. Members spend many hours in the school undertaking a number of jobs including listening to children read, (the library has been reorganised this year), helping in the school garden (a new greenhouse opened this was financed by Rotary) and other day-to-day activities. 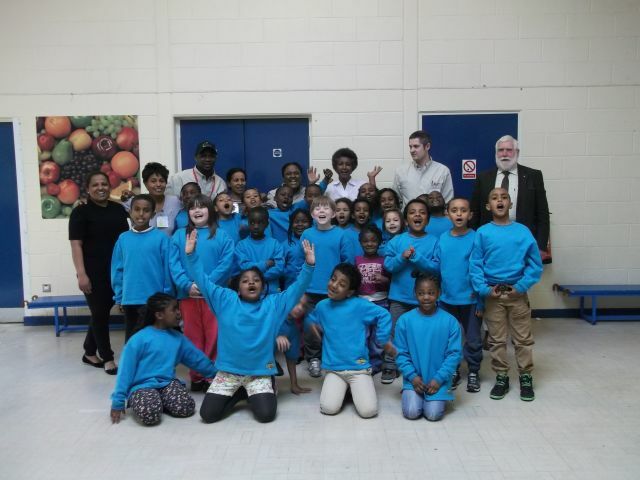 St. Peter’s is an area of extreme social deprivation and has 97.6% of pupils from black and minority ethnic communities. Over 30 languages are spoken by the children, some of whom have special educational needs. In this context the school identified the growing number of pupils with communication problems, especially those on the autism spectrum. 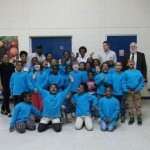 A multi-sensory room was considered to be the ideal environment to help meet their needs. Staff drew up a list of equipment needed and the club has raised over £1200 to furnish the room to support pupils in a calm environment. Although it is early days and the room was only completed in September, staff report real success is being seen and they are sure the room will facilitate continued progress for the pupils in need in future years. It is the last day of the first half of the Lent Half Term. Every child in the School has chosen an animal poem in English, learnt it off by heart and performed it in front of their class. The heats have taken place and what has already happened is an enormous fact for celebration. The finalists, six from Keystage One and eight from Keystage Two, now face the final daunting task of performing their poems in front of the entire school, parents and five judges. The two remaining gaps on the Rotary Recital Shield will soon be filled. Mrs Liz Holliday, Headteacher, introduces the judges. From The Rotary Club of Headingley two of the judges, Chris Walbank and Steve Bates, are also school governors and they are joined once again by Colette Crossen. They are assisted by two important contributors to the School: Kath Wooffitt , the School cook and Peter Edson, an assistant voluntary caretaker and constant helper. Music is very much at the heart of the School’s being and with Dr Simon Lindley at the piano and Mr John Robertson in charge we know that we are going to hear a magnificent array of songs: sung to standards which you will not find matched in many places: with an enormous variety of expression and clarity of diction, the harmony playful and subtle, notes sustained and fully sounded and the joy of singing well, evident on every face. 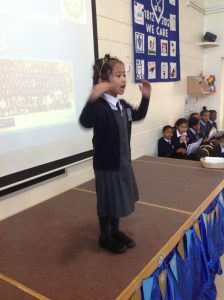 In Keystage One the youngest performer was four years of age and each child gave us their poem twice, often growing in confidence. Remember that the task of performance is matched by an equal feat of memory. The winner in this category, reciting Eleanor Farjeon’s poem “Cats Sleep Anywhere” was Blyth Carag. She is 5 years of age, originally from the Phillippines, and her first language is Tagalog. Rotary Club of Headingley to be so warmly welcomed to be part of it. Chris Walbank: Foundation Governor: with responsibility for Special Educational Needs and the Disabled and Children Looked After. Governor responsible for Safeguarding and Child Protection. On two committees: Pupil and Curriculum; Academy issues. Chris has made two recent formal visits to the School, observing guided reading in Year 3; and reviewing SEN and D provision with Sarah Parry (Deputy Head). He chaired the last two Pupil and Curriculum meetings (December and January). He has two training sessions booked with Education Leeds: on the role of the SEN and D governor; and the role of the governor responsible for Children Looked After. He has been asked to adjudicate the new Story-telling competition for which senior pupils will enter in three weeks’ time. Steve Bates: Foundation Governor: with responsibility for Health and Safety. He is also on the Finance sub-committee, meeting last on 31 January. 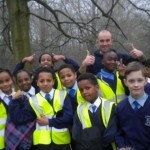 He also comes into the School on a weekly basis helping the children with planning and growing plants for the school gardens. Council has just authorised expenditure on Spring seeds. Both Steve governors have attended Staff training on Sexual Exploitation of children. 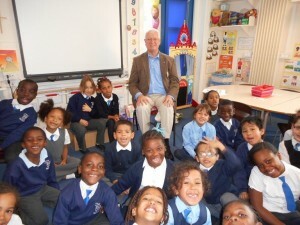 John Hafseth: John comes into the School once a week and hears extra reading practice for Year 6 children. Nick and Gill Pinches: Nick and Gill have taken on the important role of organising and running the School Library. They currently spend a couple of hours on a Wednesday sorting it out. I suggest that Nick is invited to give a brief report to Council on progress. Recital which, incorporating a fine concert, took place on the last morning of the first Half of The Spring Term. A report appears on the website of this happy event. Given the context of this Inner City School (75% of children English as an Additional Language; 29% on free school meals; 15% on the SEN register; 53% eligible for Pupil Premium), the standard achieved by the finalists was quite amazing. The names of winners from KS1 and KS2 will appear on the Rotary Recital Shield which is displayed in the Foyer. 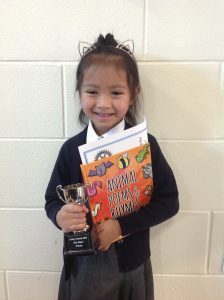 Six Finalists were presented with book prizes and the winners also received cups. 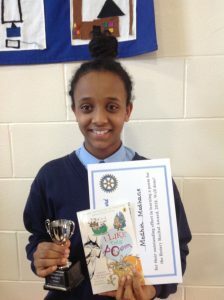 The Rotary Recital, which involves all children learning and reciting a poem, the finalists performing in front of the entire School, judges and parents is now a vital part of the English curriculum. Recent awards won by the School include recognition of the highest attendance figures in the Leeds Inner East Cluster of Schools: 98.4%. There is a space for any Rotarian who could come in one lunchtime a week and run a Lego Club. See Chris. 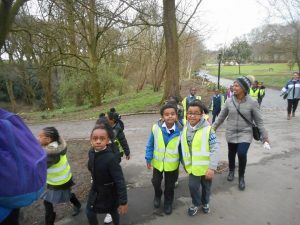 On the Thursday before the Easter Holiday, Nick and Chris joined staff and parents on the annual Sponsored Charity Walk in Roundhay Park. 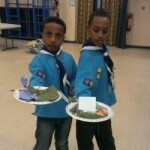 Last year they raised over £300 for starving children in Africa. Members and their guests were delighted to be entertained again by the choir of St Peter’s Primary School before Christmas lunch. It has become a regular feature of the club’s Christmas calendar to have the pleasure and delight of being entertained by St Peter’s Choir, accompanied by Simon Lindley and conducted by the school’s Music leader John Robertson. We are most grateful to Headteacher Liz Holliday PHF, for making this possible and accompanying the children for their outstanding performance. 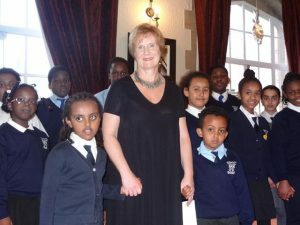 President Pran gave a donation to the school’s ‘Bug Club’ reading project and Mrs Holliday took the opportunity to thank the club for their ongoing support, not just in monetary terms but also in time spent by members assisting the school in various ways including providing a member of the Governing Body. 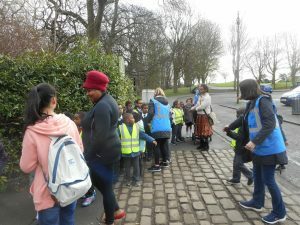 “Our relationship with Rotary Club of Headingley ﬁrst began when I was invited to give a short talk to members about St Peter’s School. This was most enthusiastically received and afterwards a number of members came to visit the school and asked about how they might offer their support and skills to us. As it was the year of our bi-centenary, the volunteers gave help in researching the history of the school, Chris Walbank being particularly skilled and unearthing many photos and articles about the founding of the school and how it evolved over time. Like the growing success of the school, our relationship with Rotary has grown and developed involving more and more members in many different ways : Gardening, Governance, help with trips, help with sponsored walks, hearing children read, running a lego club, giving talks to pupils, attending concerts, donating money for musical instruments, providing dictionaries and even dressing as Santa Claus have all added capacity, variety, knowledge and skill to our school. 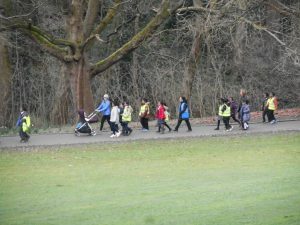 The contribution Rotary make is not just about the many hours members give up to spend with our staff, parents and pupils, it is about what they bring as people when they walk through our gates. Their enthusiasm, interest and genuine care for our pupils and staff make us all feel valued and acknowledged for the work we do. 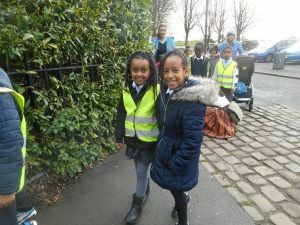 They are always interested in what is happening in school, they always take the time to ask questions, they always celebrate what is best about St Peter’s and they very much follow our school motto : We Care. This year we were delighted to add another award to our leaver’s assembly. This was called the Rotary Award for Service Before Self. This was awarded to a pupil who lives out that principal in school and it shows how much we value what Rotary stands for too and the wonderful contribution the members make to our school throughout the year. President Iain Farquharson-Welsh presented 32 new dictionaries this week to children from Year Four at St Peter’s, in an assembly given by Headteacher, Liz Holliday, on the subject, appropriately enough, of Christian Aid Week and the opportunity to share with others less fortunate. In a short speech extolling the book above the tablet or computer, Ian pointed out that it needs no batteries or signal, no time to load up or go wrong and could be left with a book mark inserted to resume reading in an instant. Any small piece of paper would serve as a bookmark. Indeed he had once found in a book from a Shetland public library, a rasher of bacon marking the place left off! One hopes that Year Four will treat their new dictionaries with more care. The Usborne Children’s dictionary has over two thousand illustrations and were purchased under the Dictionaries 4 Life scheme run by Basingstoke Rotary Club. This gift coincides with the enrichment of the school library with the gift of over 50 new reading books by Mrs Vanda Cleary and her husband and the visit of School Governor, Rtn Chris Walbank, to explore the school library and visit the Reading Club held every Tuesday. 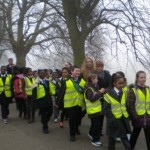 And in April 2014 the children took part in a sponsored walk. Thumbs up. We made it! Enough money was raised during Lent to purchase two units of ‘Literacy in a Box’, sending books and stationery to a primary School in Zambia. Headingley Rotarians joined in the fun. £300 was also raised by the children for ‘Cash For Kids’. Congratulations St Peter’s; we are proud of you! Further development in 2015 are by Rotarians John Hafseth and Steve Bates. John hears children’s reading once a week and also runs a Lego Building Club. Steve works with children growing plants, both flowers and vegetables; mostly fair weather work, next Spring should see the fruits of their work around the grounds. Chris once again enjoyed talking to six year olds about toys and games he remembers from when he was a boy. At the invitation of the Diocese, Chris Walbank became a Foundation governor of the School in August 2015.In December 2015, Headteacher, Mrs Liz Holliday, was awarded a Paul Harris Fellowship which recognises her contribution to the community of Burmantofts, to Leeds and, by the example of St Peter’s as “an outstanding school” (Ofsted 2011), to British Education. 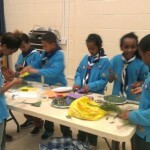 The beavers and cubs thrive with under the guidance of an experienced parent. 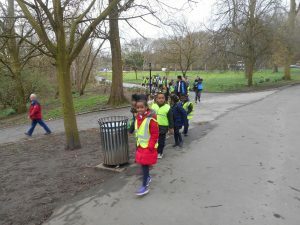 We have developed a link with St. Peter’s Primary School in Burmantofts, a school offering an “outstanding education” (OFSTED) to 242 children in a catchment area of 85.5% black, immigrant housing and where 37% of the children have English as a foreign language. Liz Holliday, Headteacher, spoke at a lunchtime meeting, following which 15 glockenspiels were donated to the school by the club. Chris Walbank, our New Generations/Youth Opportunities Officer has helped research the history of the School from its foundation in 1812, which resulted in a booklet printed to celebrate the bi-centenary in 2012. 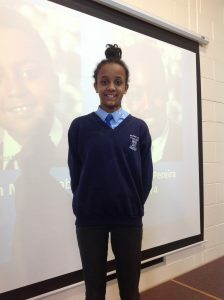 The first ROTARY RECITAL took place in February 2013: the names of the winners of Keystages One and Two appearing on a shield in the school. 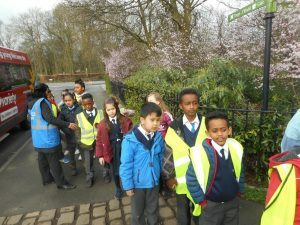 All children learnt and recited a poem. 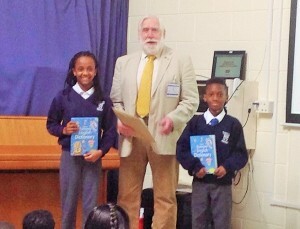 The finalists performed their poems in front of four judges including children’s writer Hilary Robinson. Later in 2013 we gave £250 for the purchase of books for Keystage Two readers. In the autumn of 2013 Rtn. Monty Reid joined the Governing Body as a representative of the Club.